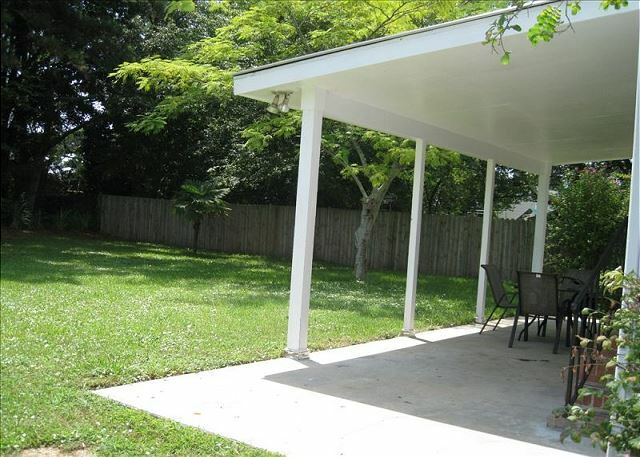 Great private back yard for kids -- newly added outdoor shower not seen in pics yet. Golf cart provided for your use -- extra fun to shuttle to the beach or excursion for ice cream in the evenings. 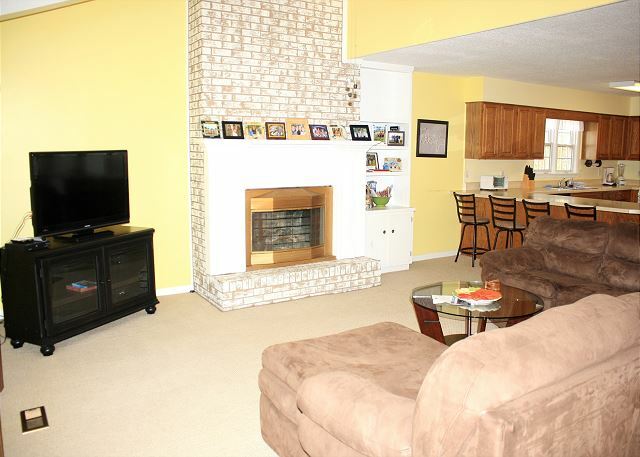 Comfortable, spacious living room with great seating for movie night! Flat screen TV and upgraded internet service. Decorative fireplace in the living room. Downstairs master bedroom with flat screen TV. Your reservation includes all bed and bath linens, and beds made freshly upon arrival. Downstairs master bath. Roomy and clean. Guest Bedroom with one queen and one twin bed. Bed linens included. Upstairs guest bedroom with TV -- lots of space to park the kids. Guest bedroom with three twin trundle beds -- sleeps a total of six. All bed and bath linens included for your stay. Covered patio off the kitchen with outdoor furniture and grill. New outdoor shower has been added since these photos. 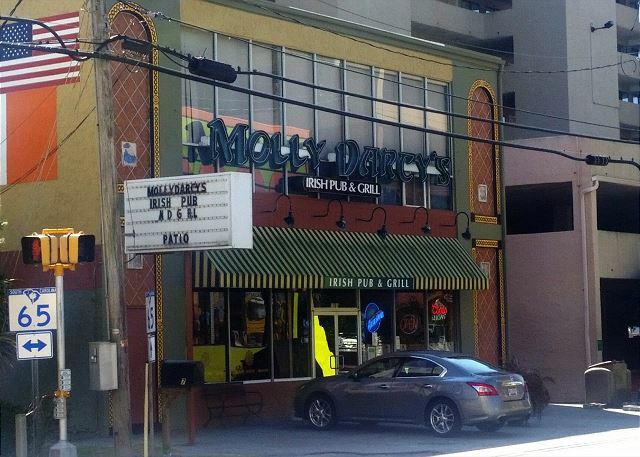 Molly Darcy's Irish Pub - just a couple of blocks away and the perfect place for lunch or happy hour on the ocean front sun deck. Beachwear shop 2 blocks from the house, ice cream and hot dog stand on the same block. 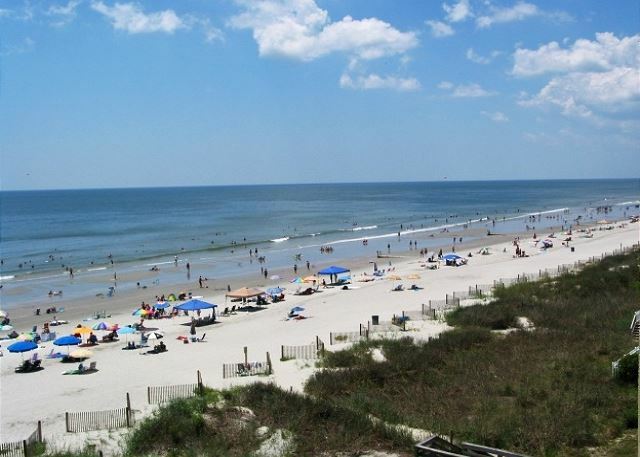 Crescent Beach is just 3 blocks away - Take the golf cart for a spin! 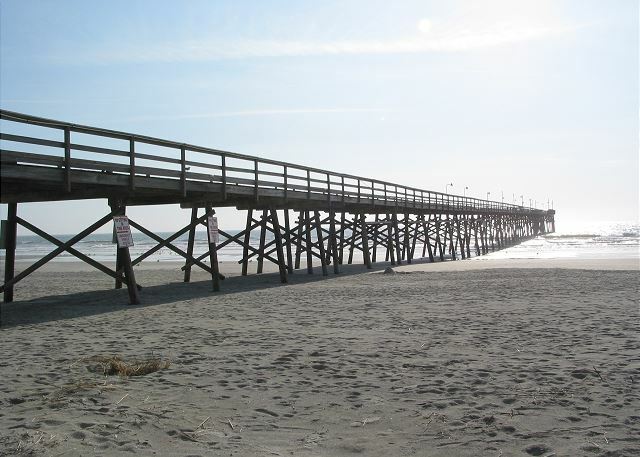 Enjoy any of our local Grand Strand fishing piers. Historic boardwalk in downtown Myrtle Beach -- under new renovations every summer. This great rental will include all of your bed and bath linens, including freshly made beds upon arrival and your departure cleaning. 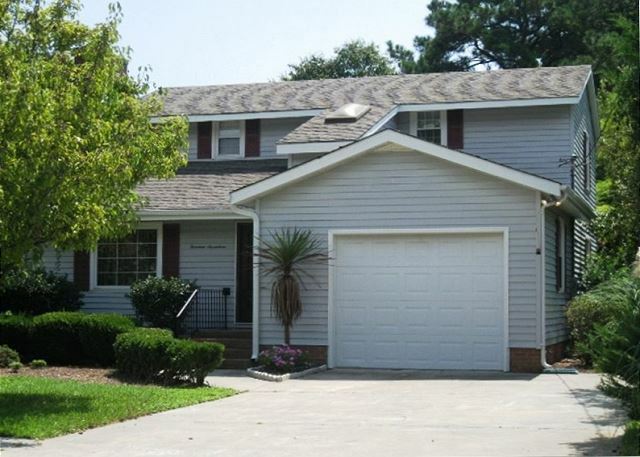 A cozy private home located in a quiet residential section of the Crescent Beach area, here in North Myrtle Beach. Just close enough to the beaches and local pit stops but with the quiet privacy and curb appeal of having your own beach home. 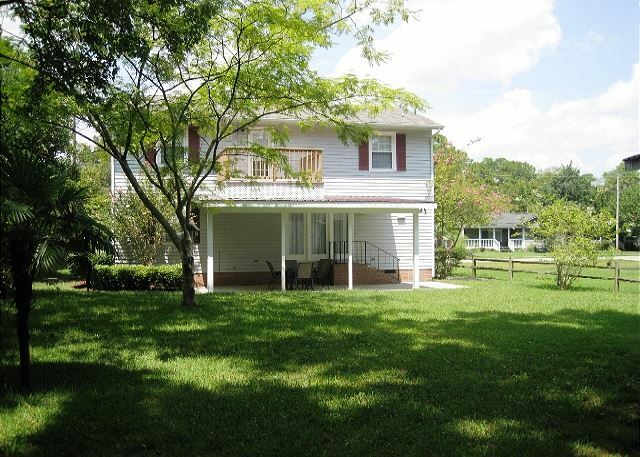 This 1,800 sq-ft, 3 bedroom, 2 bathroom house sleeps 6 to 12 people comfortably. For your added convenience, a golf cart is included in the rental!! 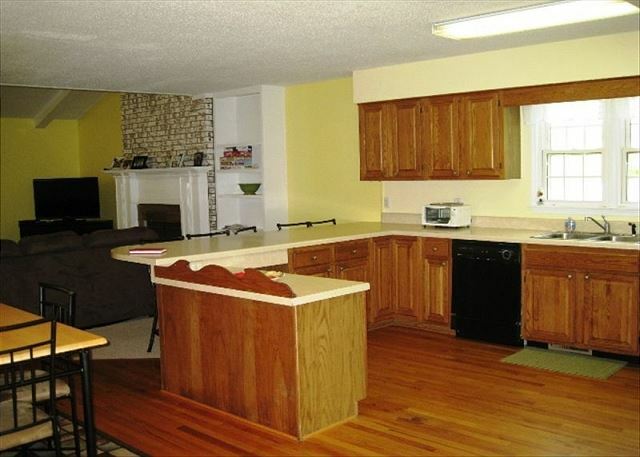 HIGHLIGHTS: Large open first floor with Living / Dining and Kitchen areas, WiFi and cable TV. The eat-in kitchen seats four for dinner or enjoy the outdoor patio for dining. The living room has a 42-inch flat screen TV and DVD player. 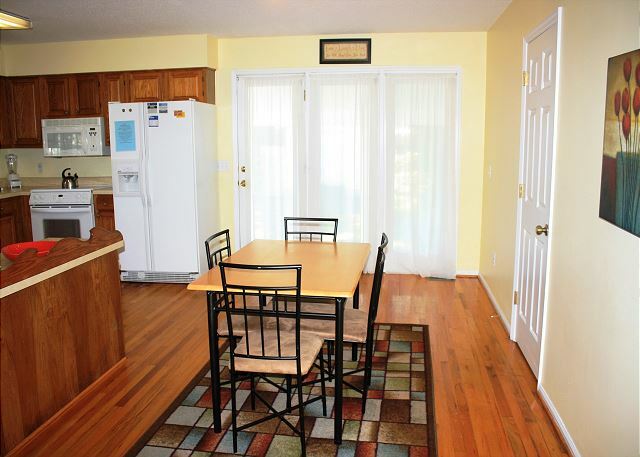 Outside is a covered table and chairs near the gas grill and a second floor deck for sunbathing! Garage with beach chairs, sand toys and gear PLUS the golf cart. The house is 3 blocks from the beach on a residential street with sufficient off street parking for multiple vehicles. 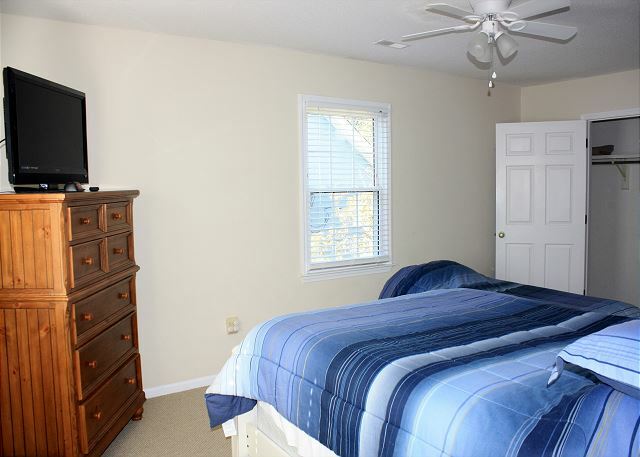 The Master bedroom is on the first floor and has a King size bed, 32-inch flat-screen TV and DVD player. Upstairs there are two large bedrooms, Bedroom 2 has 1 Queen + 1 Twin trundle; Bedroom 3 has 3 Twins with trundle pull outs. One of the upstairs bedrooms has a 32-inch flat screen TV and DVD player. Barefoot Landing is just a 5-minute drive away - you may spend many evenings strolling through this complex of over 100 shops and restaurants. Broadway at the Beach is approximately a 25-minute drive, and save a rainy day for shopping at the Tanger Outlets. Alligator Adventure is a must-see for the whole family, and great live theater shows are close by at the Alabama Theater, House of Blues, Pirate's Voyage, Carolina Opry, and Palace Theater! A perfect house for some quality family time. An open layout, a patio, and yard make for good gathering spaces. One block off the awesome crescent beach makes, beach, trips super easy, plus a golf cart and all the beach chairs and toys you could need are provided. Highly recommend this rental. Thank you -- we could not have said it any better, ourselves. Everything for a group or family getaway is factored into a wonderful stay in this private home, named the "Fitzy House". The only thing not mentioned is the outdoor shower for rinsing off after the beach. The nice residential location makes it possible to hop on the golf cart to shuttle the kids or grandparents back and forth to the beach or for ice cream excursions in the evenings. Thank you for giving such an excellent rating and we hope to hear from you again. Great place to vacation. House was wonderful. This place was great. I give it a 5 all around. I look forward to renting this property again. Great place to vacation. Thank you for the perfect 5 rating and for taking the time to complete our survey, we appreciate it. Fitzy's House is a great place to vacation, we agree with you. Don’t let the great price fool you! This place has everything that you want and need to enjoy your beach vacation, it even comes with a golf cart for you to use during your stay. We thank you again for staying with us and we would invite you to return. Sincerely Your ODVR Team. The whole process was very easy. VRBO was excellent to work with. 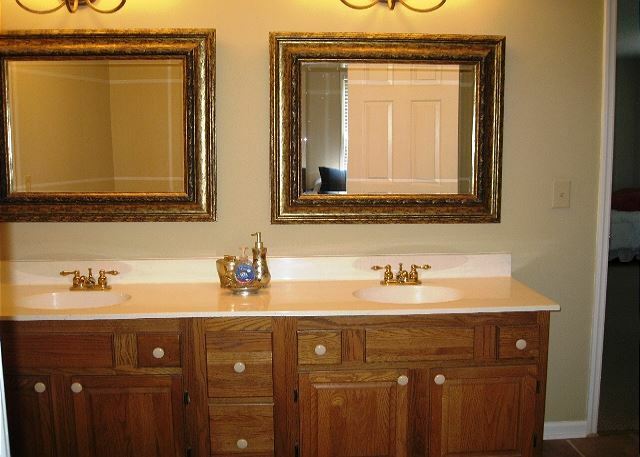 The home is just as the pictures look and is very clean. Both the owner and manager of property were very attentive to any needs. We would definitely stay here again and will use vrbo in the future. The beach is 3 small blocks away and restaurants and stores are very close too.